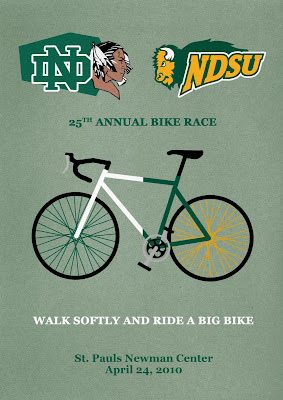 I made this poster the other day for a friend volunteering for this bike race. I wasn't suppose to spend as much time on making it as I did. For some reason I got hooked in the creation and layout of the poster. But I would have to say that this is my greatest accomplishments in graphic design. The simplistic imagery and color palette is something I have never been able to pull off. Much like the Sachplakat (object) posters of Lucian Bernhard. The most interesting thing about this layout, is how perfectly balanced it is. I started to analyze the paths and direction of the image and realized something very interesting. If you look at the image below, I made a basic tracing of the layout. 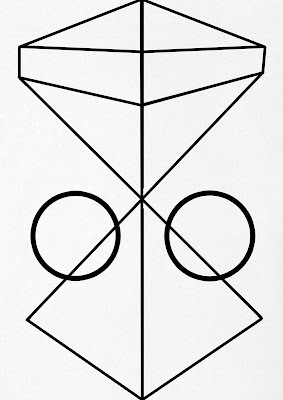 I first drew a line right down the center because the image has strong bilateral symmetry. Next I drew lines on the ends of "walk softly and ride a big bike" (I didn't make the slogan) and then I connected the ends of the slogan to the bottom center point. As you can see the date lies perfectly inside of the triangle. I thought "hmm thats interesting". So I kept drawing. I drew boxes around the school logos. Then I made two long lines from the bottom corners of the boxes to the ends of the slogan. This is where things got interestingly weird. 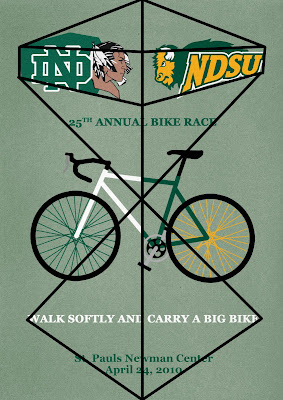 The "25th Annual Bike Race" sits nicely in the triangle, just like the date did in the lower triangle under the slogan. The intersection lines are almost exactly perpendicular. And also, as you can see the bike's center lies PERFECTLY in the intersection of the two long lines. Not only is this intersection perfectly in the bike's center, but it lies PERFECTLY in the center of the page. Weird. The funny thing is is that I did not do this on purpose. I laid out the poster by eye, only using a horizontal center line for reference. It is eerie the compositional power of the human eye. I don't believe this is just coincidence. There is a mathematical explanation to visually pleasing images. Much like the Golden Ratio. This stuff is just so interesting.